Halloween is almost here, and before you know it, trick-or-treaters will be ringing your doorbell. Decorating your house for the season should be easy, fun, and bring just the right amount of spookiness. 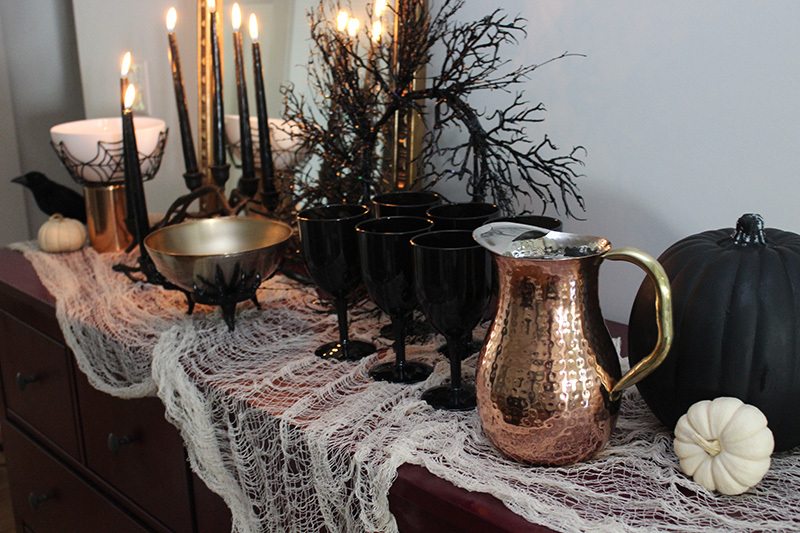 Follow these simple tips to bring hauntingly elegant Halloween flair to any area of your home. Whether you’re decorating a buffet, side table, or even front door, fabric is a great base layer. Stretch cheesecloth to mimic cobwebs, then drape it haphazardly to create a little Halloween drama. A great way to hint at the Halloween season without going too cheesy is to use bare black branches. You can cut some from your yard, strip the leaves off if they haven’t fallen yet, and give them a quick coat of black spray paint. If DIY isn’t for you, many stores have caught onto this trend, and you’ll find a variety of black branch wreaths and even candle holders. Few things say magic like flickering candles. To really play up the season, trade in your traditional white tapers for black. 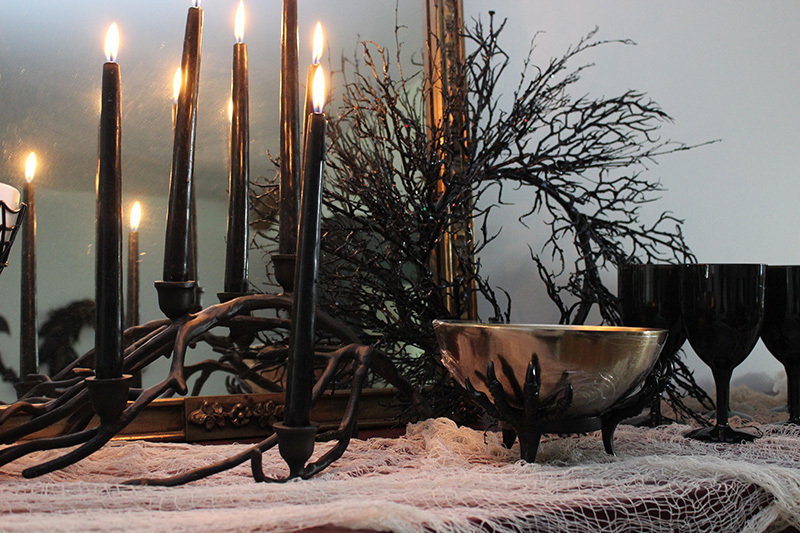 Nothing is more stylishly spooky than black candles in a black candle holder. 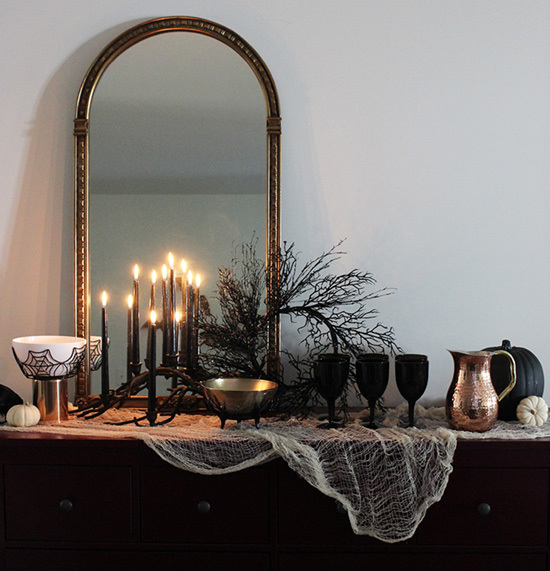 For added effect, place the candle holder and lit candles in front of a mirror. The reflection gives off a truly eerie glow. Trade the usual orange pumpkins in for some black and white. The white ones are available any local farmer’s market. For the black, head to your local craft store. They have these faux black pumpkins in a variety of sizes this time of year. 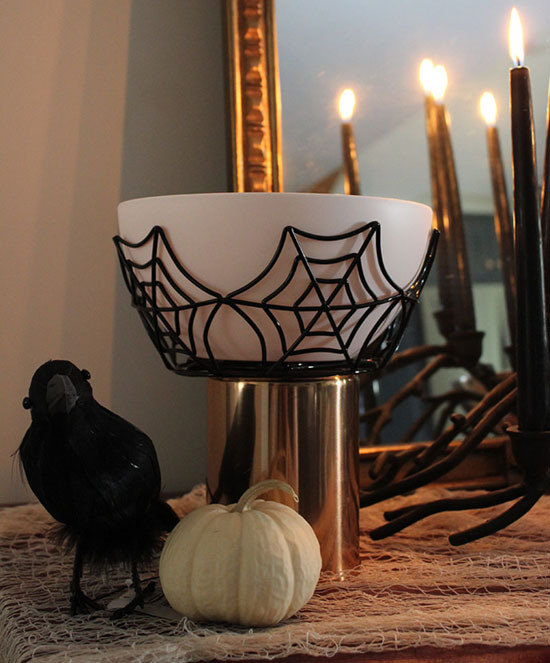 Don’t go overboard with the spiders and bats, but a few of these Halloween symbols spread throughout your vignette can add just the right finishing touch. For example, a raven is the perfect creepy character to tuck into your scene. Another nice touch is a candy bowl with some real seasonal personality. The stores are crawling with spider- and claw-adorned serving bowls. Just stick to the black and white palette, and it won’t compete with your other decor. Whether you’re decorating for a party or just making your home festive for youzillor family, these tips will turn your Halloween house into the hit of the block.